Crocheted dishcloths are the best for cleaning. The textured surface is not only good on dishes and surfaces but is also soothing across the skin. For this pattern I used the Lemon Peel stitch. It is a combination of alternating single crochet and double crochet stitches, which gives the dishcloth a bumpy texture. The stitch gives a nice contrast to the shell border. The Lemon Peel stitch alternates sc and dc. Repeat rows 1-2 until you reach the desired height of your dishcloth. Mine measures 10 inches wide and 10 inches height, after 32 rows. There should be a long tail at the end of the dishcloth. You will be returning to it after you finish the shell border. Once you are finished with the dishcloth part of the pattern, you will add a shell stitch border. It is your preference whether you would like to change the color of the border or keep it the same color as the dishcloth base. A shell stitch is a cluster of 6 hdc in the same stitch. To complete the shape of the stitch, you will skip a stitch and then slip stitch into the next stitch. Note: A traditional shell stitch is usually made using dc, however for this pattern, I modified it to hdc. Beginning the shell stitch border: Start on the top corner of your dishcloth, at the beginning of row 32. This should be a sc. Slip stitch (sl st) into that sc. Note: The shell stitch and the slip stitch are about an inch long. Repeat between *** and *** until you finish off the top of the dishcloth with a total of 10 shell stitches. Turn your work to crochet the next part of the border along the side of the dishcloth. You will be repeating the shell cluster and slip stitch pattern. Along the side of the dishcloth, it is less calculated to determine where to shell stitch and where to slip stitch. I eyeball it, accounting that each shell/sl st are about an inch long. There should be 10 shell stitches along the side of the dishcloth, ending with a sl st in the corner. Along the bottom of the dishcloth, you’ll be working in the foundation chain, repeating the top row’s border. From the corner that you just did a sl st in, skip the first stitch in the bottom row and shell stitch. Skip the next stitch and slip stitch. Repeat across the bottom of the dishcloth. There should be 10 shell stitches across the bottom. To finish off the border, work along the last side of the dishcloth. working 10 shell stitches and slip stitches along the side. Finish off the border with a slip stitch. Sew in tail using your yarn needle. To add the finishing touch to the dishcloth, add a loop to your dishcloth to use for hanging. Return to the long tail of the dishcloth yarn that you left before starting the shell stitch border. Chain 10 with the long tail. Sew in the rest of the long tail, weaving so it in so won’t unravel in use. Be sure all tails are sewed in carefully. 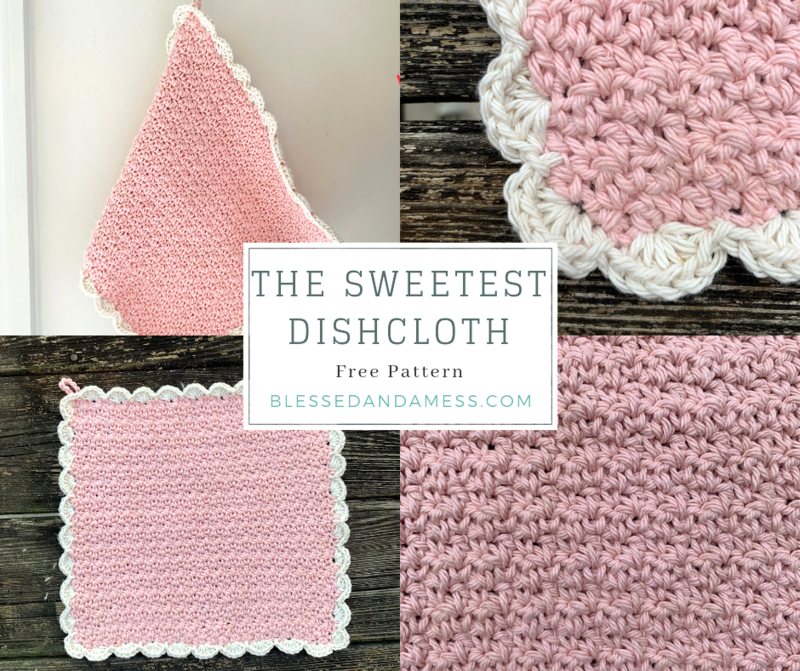 Once finished, your sweet little dishcloth is ready to be used! Or if it’s a gift, feel free to use my Free Dishcloth Package Printable. That being said, I guess I can’t procrastinate any more than I already have. Happy Spring Cleaning everyone!